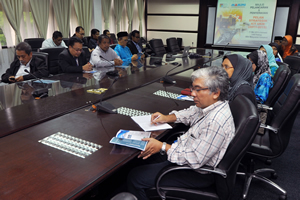 BANGI, 11 May 2012 – The Malaysian Administrative Modernisation and Management Planning Unit, MAMPU has given high marks to The National University of Malaysia (UKM) as an agency leading the charge in research through Information and Communications Technology (ICT). MAMPU Director-General, Dato’ Mohamad Zabidi Zainal said he was impressed with UKM’s commitment to working with the agency in raising the stakes of research in the university through its ICT strategic plan. He took pride with the support and involvement of MAMPU as the consultant to UKM’s ICT experts to come up with an ICT strategic plan for institutions of higher learning in the country. He made the remarks at a brief ceremony for the submission of UKM’s 2011–2015 ICT Strategic Plan at Cancellory meeting room today. The document was handed over to UKM Vice-Chancellor, Prof Tan Sri Dato’ Wira Dr Sharifah Hapsah with a copy given to Dato’ Zabidi. The plan takes into account the development, planning and implementation of ICT in UKM’s main campus in Bangi as well as at its other campus in Kuala Lumpur and the UKM Hospital in Cheras. Dato’ Mohamad Zabidi said the processes used had helped raise awareness and expertise for all those involved. 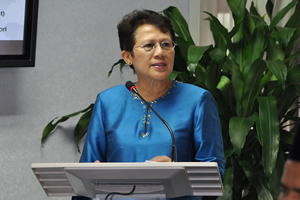 The UKM ICT Strategic Plan began in August 25 2010 and is all-encompassing. Prof Sharifah Hapsah said that ICT is the key to the core business of UKM, that is teaching, learning and research saying since ICT became widespread on the main campus, UKM became more efficent and speedier including among students and the teaching staff as can be seen all over the campus in Bangi. The in-depth development of the ICT Strategic Plan was carried out by a team led by Prof Ir Dr Othman Abdul Karim as the project director. 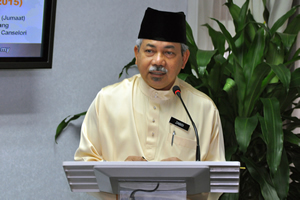 Consultancy for the project was provided by a team of strategic ICT consultants at MAMPU led by Dato’ Dr Zahari Othman. The plan is a long-term one that determines the direction of planning, strategic development and implementation of ICT projects to support the achievement of UKM’s vision and mission. The plan, which is part of the public sector ICT strategy, details the objectives of the ICT policies. It is aimed at ensuring that ICT management in all agencies are in line with the public sector ICT strategy. Also present at the ceremony were the Deputy Vice-Chancellor for Academic and International Affairs, Prof Datuk Dr Noor Azlan Ghazali; Prof Ir Othman who is also Deputy Vice-Chancellor for Student Affairs and Alumni and Deputy Vice-Chancellor for Research and Inovation, Prof Dato’ Dr Rahmah Mohamed. MAMPU is tasked with taking the lead role in implementing modernisation strategies for the Malaysian Public Service. In implementing its responsibility, MAMPU says it focuses on initiatives that can upgrade the quality, efficiency, effectiveness, and integrity of the Public Service. All these initiatives encompass the areas of quality acculturation, organisational development, integrity management, ICT development and enhancing relationships between the public and private sectors. The modernisation initiatives implemented by MAMPU have to be conveyed widely to all government agencies by all available channels in order ensure accurate and updated information are readily available.